Doing chores, housework or running errands with a baby can be a challenge. 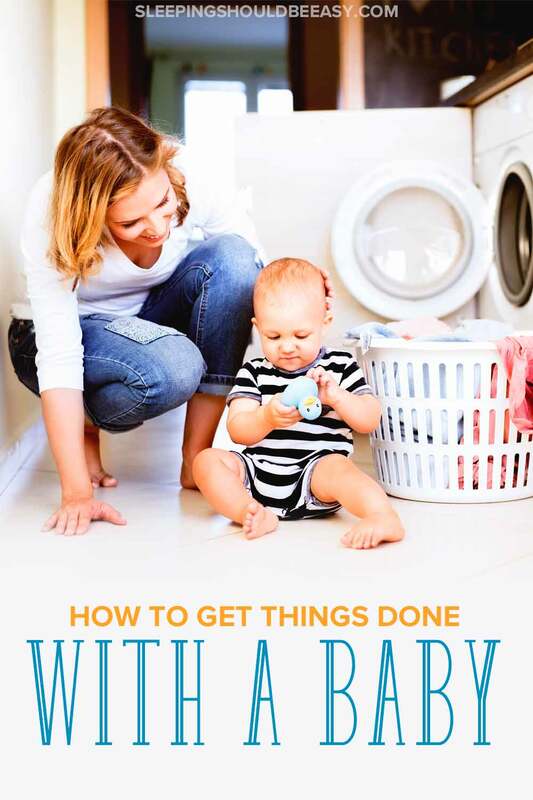 Learn how to get things done with a baby, even if you’re on your own. I’m going to drive to the library, I challenged myself. I had books to return, and I figured it’s about time I learned how to run errands even with my baby in tow. I drove to the library, parked the car and lugged the stroller out of the trunk. Then, to my horror, I couldn’t figure out how to unfold the darn thing. Without the stroller, I’d have to carry the baby around the library with both arms to cradle his wobbly head. I wouldn’t be able to carry the books, or even open the door. I felt frantic but also disappointed in myself as I wondered, How do you get anything done with a baby? Maybe this is typical of first time moms. We feel like we can’t get anything done or run the errands we need to. The thought of being home all day scares us, especially when we’ve never been alone with the baby before. If you’re like me, you try to cram everything during the few precious minutes your baby is asleep. Wash the bottles. Fold the laundry. Prep for dinner. It seems logical: the more you do now, the more free time you’ll have later to relax. Except here’s the problem: All that “free” time? You’ll still find a way to fill it with even more tasks. For instance, my baby would finally take a nap, so I’d figure I should get a head start on stocking up the diaper bin and taking out the trash. When I had taken care of that, I thought I might as well put the pump parts away so I wouldn’t have to deal with them later. Then once I finished that, I’d dive right into washing dishes so I’d have it taken care of sooner than later. Well, with all that done, you’d think I was able to relax the evening away, except… the tasks never stop. I wasted the time I could’ve used to relax in that present moment by trying to make up for more free time in the future. Which, of course, never happens. Instead, do just one thing. However annoying it is to have dishes pile up, deal with it at the next opportunity. Doing it now isn’t going to guarantee you’ll have free time later on. Once you’ve done your one thing, give yourself time to relax, guilt-free. Just because your baby is immobile, doesn’t mean you’re stuck in one place. If you had seen my home, you would’ve found more than one blanket on the floors of each room. You’d have also seen bouncy seats, cribs, portable play yards and swings, all ready to hold a baby. If I needed to be in the living room, I already had a blanket and pillow ready to go. His bedroom of course had the crib. Even when I needed to cook in the kitchen, I’d bring the infant seat to place him in. A baby carrier also frees your arms to do other things while keeping your baby close to you. 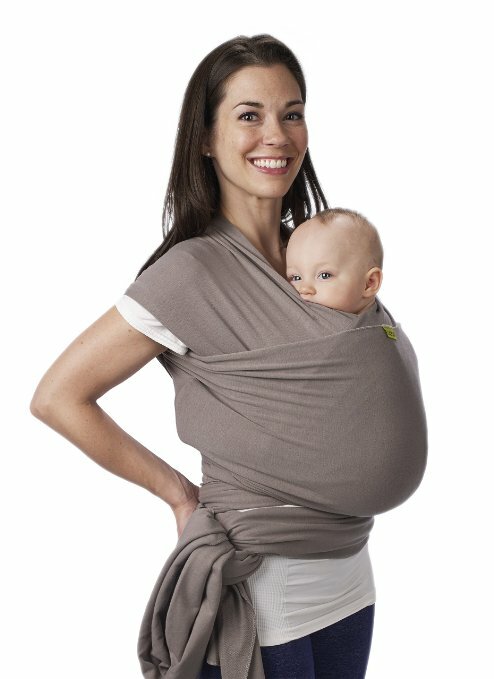 I relied on the Moby Wrap which helped free my arms while still holding the baby. A baby wrap keeps your baby close and your arms free. And don’t make the mistake I made at the library and wait until it’s too late to give your baby gear a test drive. Give it a go before your baby arrives, and again during those first few days and weeks. Figuring out baby gear when you’re alone isn’t the best feeling in the world. This seems obvious but so important that I’m putting it here. Ask friends and family to come over to help. They can watch the baby while you shower and bring you food so it’s one less meal you have to cook. They can even stay home with the baby so you can run an errand. Don’t feel like you have to entertain, either. Go to your bedroom to take a nap, and don’t bother with offering food or cleaning your home. They’re here to help, not to expect entertainment. Read 12 rules your friends and family should follow when visiting a new mom. Though our home never looked magazine-worthy before we had kids, my husband and I still kept our home clean. We checked off weekly chore lists, our carpet was pristine, and everything belonged where it should have. Enter the baby. The weekly chore list became monthly before it eventually became “whenever we remembered.” The windows weren’t squeaky clean, and the baby clutter made its way in. Here’s the thing: it’s okay. This is the season of messy homes. You’ll find your groove back at some point. For now, focus on the daily essentials like wiping kitchen counters and washing laundry. Accept that it’s hard right now, and that you’ll have your home in order down the line. Learn how to avoid baby clutter. The trick to getting things done with a baby is to do little tasks at a time. You may not be able to spend an hour on one task any longer, but you can sneak in five minutes of putting clothes away. Your baby may not nap for five hours each time, but the few hours or even minutes can be all you need to vacuum the floor. Alone time is good for the baby too. We don’t need to play with them 24/7. They can feel overstimulated if we hover over them all the time. Instead, think of the few minutes you’re not directly engaging with your baby as his downtime to process all he’s learning and observing. When I had my twins, I met a mom at a farmers market who also had twin boys the same age as mine. We were also both about to go back to work after maternity leave around the same time. You see, while I had brought my twins alone to the market, she had her sister with her. She admitted feeling terrified going by herself. And the funny thing is, I was very much like her in the beginning. I couldn’t imagine how anyone could or would be out and about with their twins alone. But however scary the thought may be, I challenged myself to do just that. It was hard, especially at first, but then you get that feeling of coming home and thinking, I did it. Challenge yourself. You’ll see that you can do things that before had seemed impossible. Yes, it’s tough. That first day alone with the baby is exhausting. I still remember bouncing from one baby to another when I was alone with the twins. But, like with any challenge, you think to yourself, Wow, I just did that. And more importantly, I can do that again. Don’t let your preconceptions hold you back from getting things done with the baby. Invite your sister to help make it easier, but don’t think you can’t do it alone, either. Set realistic to-do lists. It feels so much better to realize you got your list done, however small it is, than having a long list with only one item crossed off. Plan your tasks according to your day. Making calls when the baby is awake isn’t always going to work, so save those calls for when he naps. Then, do tasks like folding laundry when he is awake since those are easier to get done when he is. Don’t beat yourself up even when you get nothing done. Let the days where you get nothing done go and try to remind yourself of the day before when you did get something done. Remember why you’re doing what you’re doing. If you’re on maternity leave or stayed home to be with the baby, that is your job. If you do that and nothing else, you have achieved exactly what you are supposed to. So here’s my pep talk: you can get things done with a baby. Focus on just one thing while the baby naps so you can pace your tasks. Use and practice your baby gear so you can bring the baby with you. Ask people to help—no shame in that! And challenge yourself a small notch above what you’re used to—you’ll see that you can, in fact, get things done with a baby. Your turn: How do you get anything done with a baby? Struggling to get your baby to sleep anywhere else but your arms? 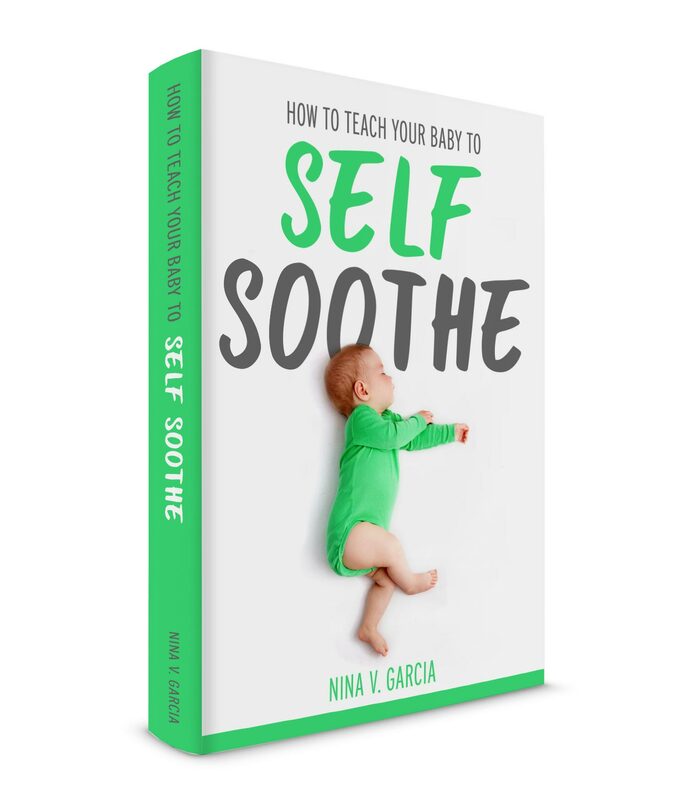 Get a free chapter of my guide, "How to Get Your Baby to Sleep without Being Held." 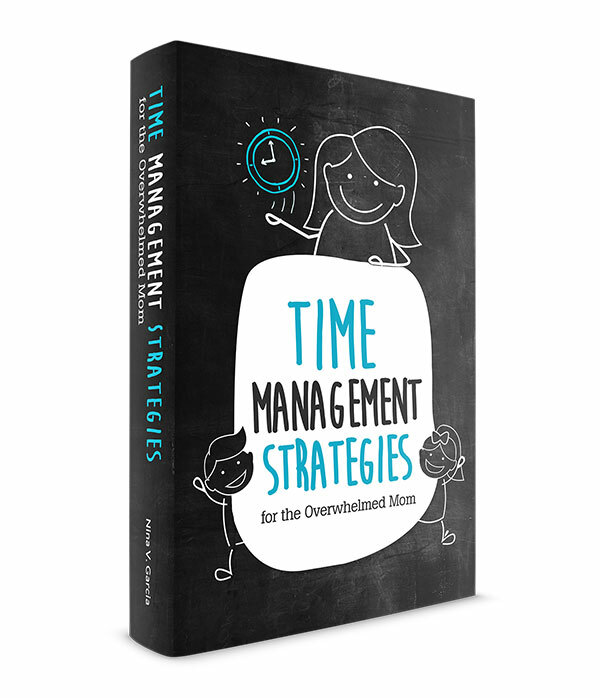 Learn the strategies, habits and routines I used to get my babies to sleep. I used to wish that every store had a drive-thru! It made errands so much easier when I could stay in the car with my firstborn and get things done at the same time. Oh my goodness Katy, ME TOO! I seriously thought they needed to have some sort of drive-thru service where they come out to you in the car just to avoid having to unstrap the baby or wake them up! I love all these suggestions. I did a lot of lowering standards. 😉 Now that my kiddos are 2 and 6 my standards are slowly, slowly raising. It’s nice to see how things have gotten easier as the kids age. I remember with my eldest, it got much easier once he reached 2.5, which is the age the twins are now! Taking small steps is definitely key, whether it’s your first or third kid. I remember wanting to go to Target just to get out of the house. I broke it down into small steps – get baby to lie down without crying, take shower, check on baby, change clothes, feed baby, etc. I think these are great tips. I especially love the suggestion to just get out the door- to try. I think it’s the only way to get over the fear! Before my third child was born, I made sure both of my older children were in preschool 5 days a week so they would have a routine and I would have some time alone with my newborn. The night I got home from the hospital my children’s school flooded and closed for TWO WEEKS. In my sleep deprived state, I actually thought I would not make it through those weeks. But I had no choice, and what felt like a catastrophe at the time was really just a little blip. Oh my goodness Lauren! What a way to bring home the newborn. Talk about plans gone awry. We did the same too—we enrolled our eldest in preschool to get into a routine. Ahhh…I remember these days! With the first, everything seemed impossible. By the third, it was all old hat! Haha yep the first one is probably the most challenging one! I had twins and they were mentally easier to handle. Micro-tasking is my way to be! I love this. I don’t know if I’ll ever have another baby, but I’ll need these tips. Especially because it will be #3! They say the third or fourth is easier hehe! Nope, the tasks definitely don’t end. Matter of fact, I’ve got the baby in my arms right now! But nothing would get done if it weren’t for slings and swings. I’d rather move the baby from the carseat to a sling than deal with a giant stroller. And swings are a great way to calm down a fussy baby. L used to take four hour naps in the swing. I don’t feel guilty about letting her do that at all! they SAY the third or fourth are easier. My third is 7 months old now and it did NOT seem easier! He was a bit of a surprise so the older two were just that – older! And still I had to relearn how to live with a newborn plus two that still want and need their mama. Great tips. Especially about lowering your standards. That’s a hard one for me – this was my second c section and it was a more difficult recovery but I still pushed myself too hard at the beginning. I felt it too. It’s important to give yourself grace to figure this new life out. Cecilia, I hear that a lot from parents of kids with a wide age gap. Heck, I had forgotten how to do newborn stuff and my eldest had only been three 🙂 And I can’t imagine doing stuff around the house while recovering from a c-section! My recovery with the twins was actually easy but with the first pregnancy, it was tough just getting around the house!